I ran across this Colombian delicacy which was being served at Mr Pollo a few years ago, although what I had was pre-made and sitting in a warming pan; a dense cheese filled hocky puck-like thing that bore little resemblance to the heavenly creations as described here by Jim Leff (the founder of chowhound) or this NYT article. Last year, Venezuelan chef Manny Torres Gimenez, became partners with the owner and has transformed the tiny space (five tables plus two counter seats) into a market-driven eatery that uses the freshest ingredients for a menu that changes daily. 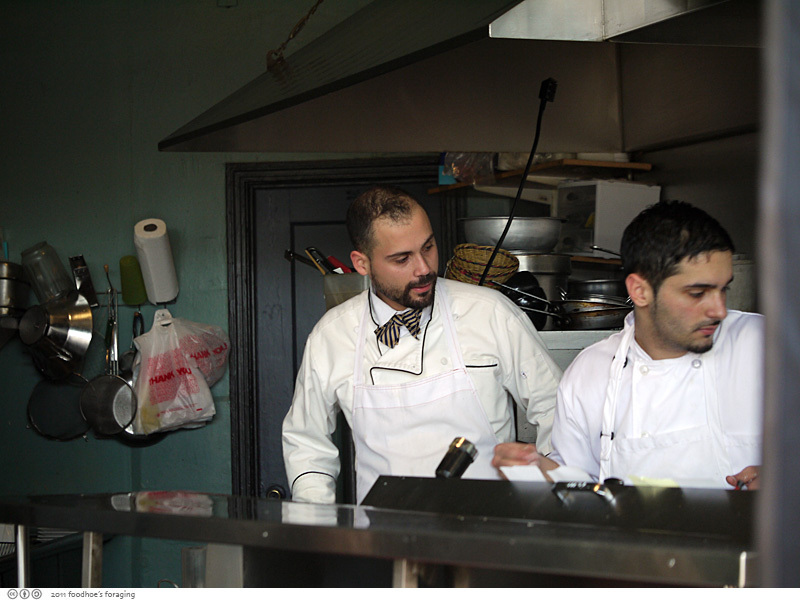 Chef Manny spent time in the kitchens at Quince, A16 and Coi, sources all the produce at local farmers markets and butchers all the meat himself. The tiny kitchen is completely open and if you manage to score the two counter seats, you can chat with the friendly chef while he prepares your meal. He had another worker who appeared to need close supervision sharing duties as cook, dishwasher, busser, runner and server. The menu is short and offers arepas, empanadas and cachapa, but the best deal is the 4-course Chef’s Tasting Menu for $15. Yes, you read that correctly, a four course tasting menu for $15. I must focus on the arepa, which is the item the that Mr. Pollo was best known for (at least before chef Manny came aboard). 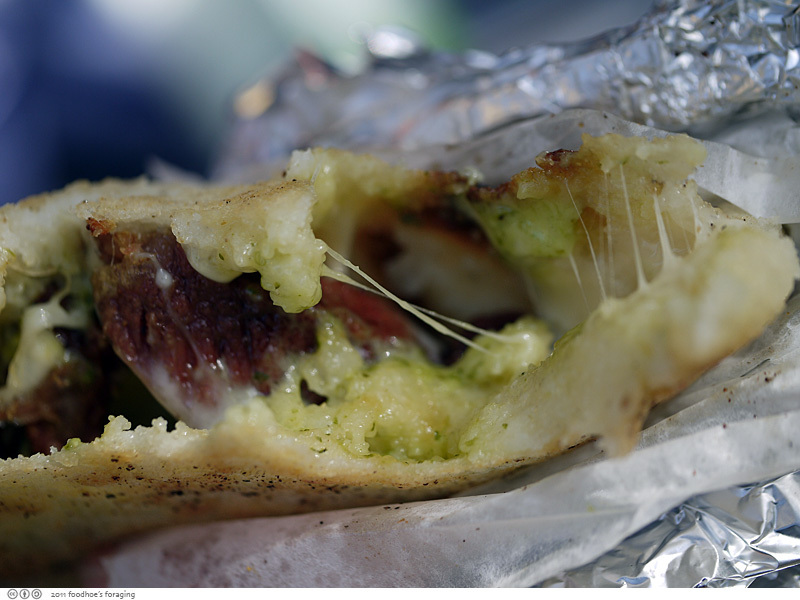 But this is a Venezuelan-style arepa, a thin walled construction that resembles a pita, but with a texture that is uniquely different. It is firm from the ground white cornmeal mixed with a bit of roux made from butter, sugar and salt which enhances the caramelization and brings out the corn flavor. It is fabulously crispy on the outside with a moist corn interior and oozing with melted cheese, a smear of richly flavored sauce and plump chunks of crispy fried pork. 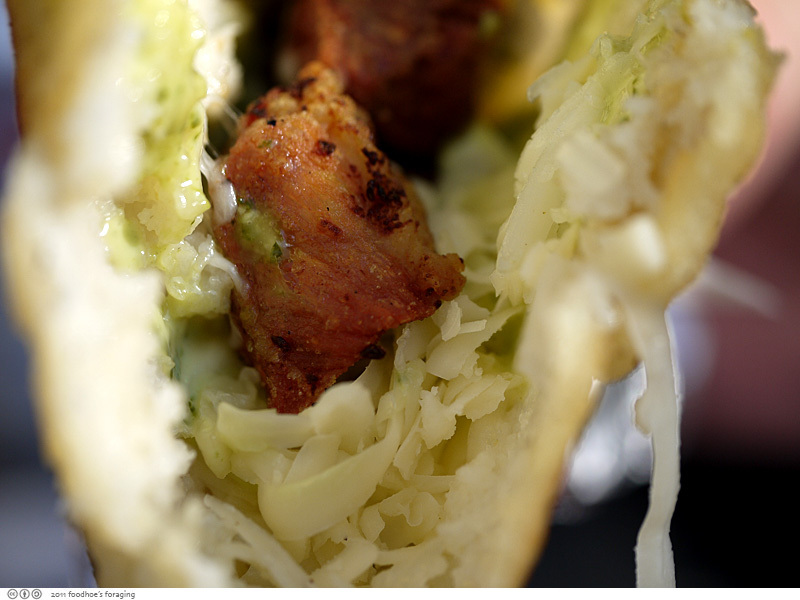 As we delved further down into the arepa, the melted cheese merged with the delectable green salsa de ajo, a verdant aioli that is made with cilantro, wine vinegar, a little mayo and garlic. Biting in reveals a heady mixture from the ethereally crisp corn shell with a slightly sticky caramelized crunchy surface, gooey cheese, savory creamy sauce and crunchy chunks of pork that have been fried to a crisp. I can see the obsesssion people have with these arepas. 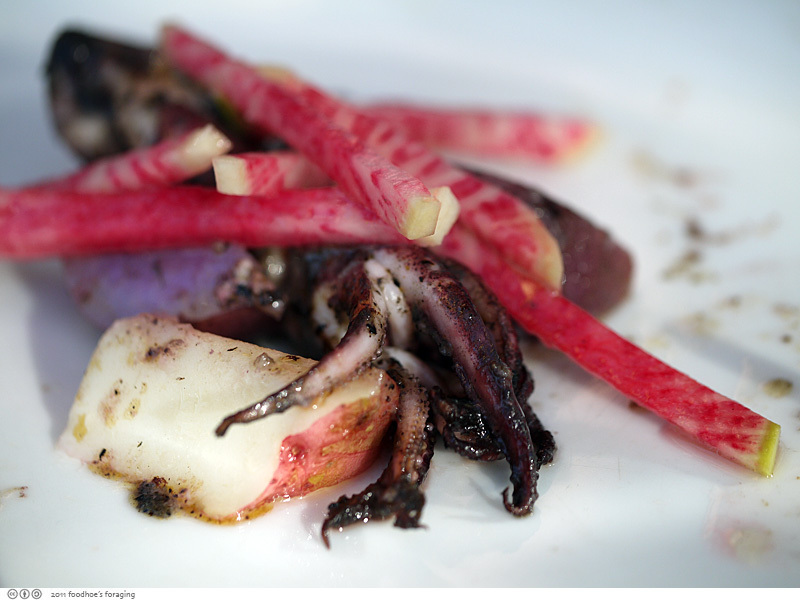 The next course was Baby Octopus cooked ala plancha topped with strips of watermelon radish, and chunks of purple peruvian potato. The octopus flesh was succulent and tender, the tips of the tiny tentacles were browned and crisp and it was tossed in a bright, lively vinaigrette. 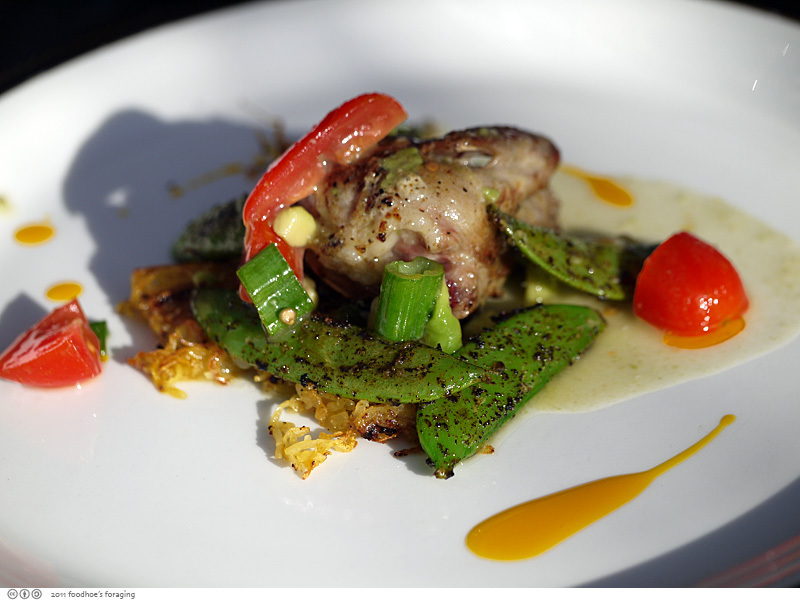 The last dish was Quail served over spaghetti squash, snow peas dusted with spicy chili powder and drizzled with an aji panco sauce. This dish was full of lusciously spicy layers of flavor and fresh textures that demanded our attention. Nice food! That quail dish sounds interesting. Wow, what a find. 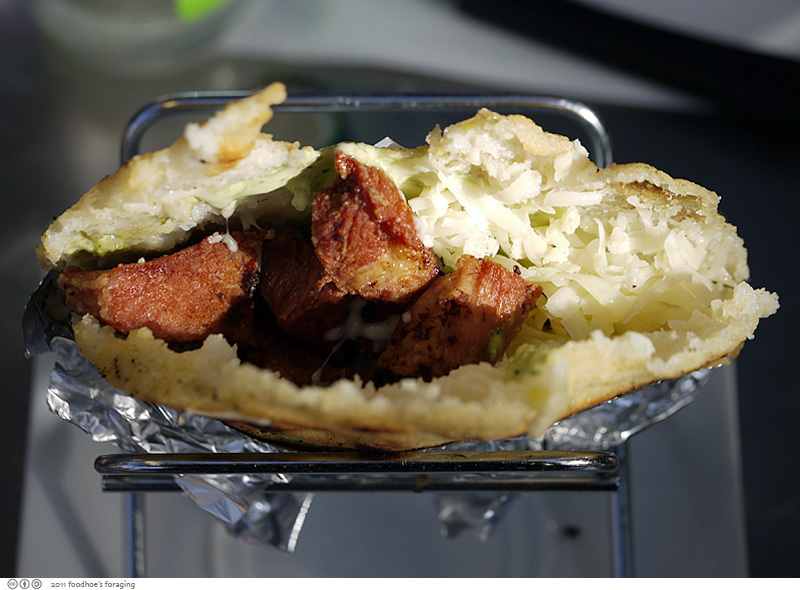 Is the arepa deep fried? 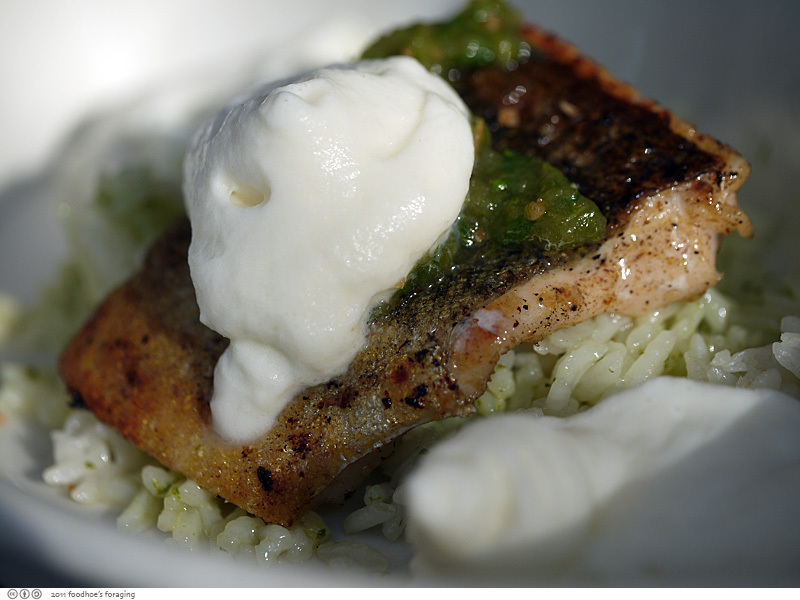 Did you do the tasting menu for lunch or dinner? Looks like fancy food but sounds like the place is like a taqueria in looks? I, too, heard about this place after seeing Chris Cosentino rave about it on the Cooking Channel. Dying to go! I can’t believe you get all that for $15. What a deal in this day and age. And that arepa looks worth $10 alone! gonna try to snag a seat when i visit the bay! 4 courses for 15 bucks? dang! 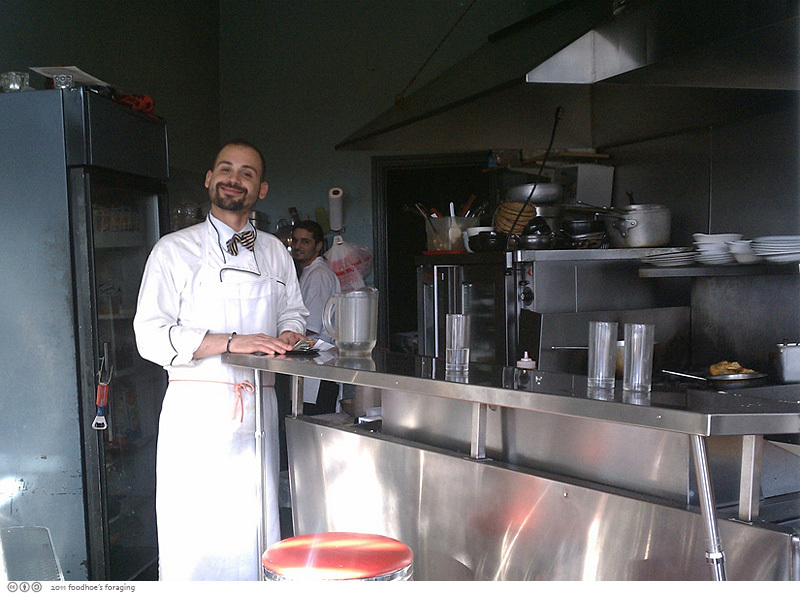 i love how the chef looks so very proud! and rightly so–the food sounds delicious. rosa, the quail was the spiciest dish, I loved how the heat factor rose with each course..
single guy, the arepa is griddled, but the pork was fried, like carnitas and boy was it good. 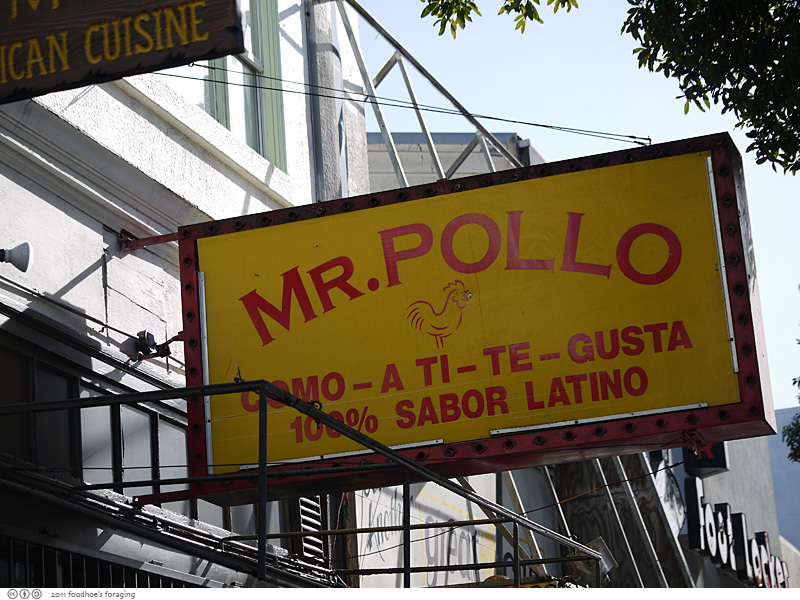 Mr. Pollo used to look a lot more like a taqueria, but they’ve gussied it up to feel like a tiny bistro, but they’ve kept the original sign which totally looks like a tacqueria from the outside. We had the tasting menu for a late lunch, they were turning the signs off while we were finishing our meal. Carolyn, it really is the best deal in the city! cathy, you must! I’ll go with you! grace, he was the nicest guy too. Such an amazing bargain, I’ve been trying to come here but the wait is long. I agree on the dessert part! this place is definitely a diamond in the rough. i had the pleasure of eating here my first night in sf. the crew was awesome and the food was amazeballs! Definitely try their dulce de leche ice cream if you’re there. Hi Coco, thanks for visiting/commenting. Mmm, sounds like a fantastic menu, did you sample the arepa? I’m really excited because I’m going this weekend, it’s been way too long!